Undercover Surrealism: Georges Bataille and DOCUMENTS was the catalog associated with the exhibition “Undercover Surrealism: Picasso, Miro, Masson and the Vision of Georges Bataille,” which showed at the Hayward Gallery in London in 2006. It sought to re-examine the works of many well-known Surrealists (or at least artists admired by Surrealists) and present them in a different light. As evidenced by the title, the exhibition and catalog revolved around Georges Bataille’s eclectic journal DOCUMENTS, of which 15 issues were published between 1929 and 1930. It examined art, ethnography, archaeology, film, photography, and pop culture, with a particular emphasis on “violence, sacrifice and seduction through which art was ‘brought down’ to the level of other kinds of objects” (11). This directly opposed orthodox Surrealism, which saw art and poetry as elevated expressions of unconscious thought and used somewhat roundabout ways (i.e. automatism) to circumvent conscious image-making control. Georges Bataille, who was decidedly unafraid of confrontational and disturbing imagery, had (somewhat unwittingly) become the leader of the “dissident Surrealists,” which was comprised of people who had either rejected Andre Breton’s idealized version of Surrealism or had been excommunicated by Breton himself for opposing/questioning his doctrines. Unsurprisingly, Bataille himself had become Breton’s arch-nemesis early on in the development of Surrealism because he viewed Breton to be too idealistic, whereas Bataille was all about the base materialism of the genre. He also preferred to see Surrealism address the unconventional– homosexuality, the uber perverse, etc– the exotic, and the macabre; Breton, on the other hand, was more focused on the notions of the ideal, heterosexual love and automatism. Bataille is frequently referred to as “the enemy within Surrealism” in the catalog, and Breton hated Bataille so much that he actually dedicated several scathing pages to him in his Second Manifesto of Surrealism (he also called him a “staid librarian” at some point, referring to Bataille’s day job); Bataille was equally bitchy and took every opportunity in DOCUMENTS and elsewhere to express his distaste with Breton. DOCUMENTS was interested in the construction and deconstruction of discoveries and materials, modern versus ancient, Western versus non-Western. However, it confused a lot of people, as it focused on so many different intellectual topics. It is therefore unsurprising to me that the catalog for this exhibition was equally piecemeal. According to the Introduction, it wanted to look at the magazine as an active force, emphasizing its core ideas. It has over 30 chapters that range from broad ideas like “Form” and “Cinema” to more limited ones, such as “Omelettes” and various artist profiles. Despite the fact that the catalog is 271 pages– and big pages at that– it was surprisingly quick to get through because each page had a 2-column structure, with relatively large-sized text taking up at least 1/4 of the page with the rest being taken up by pictures. Because it covered such a wide array of topics in a concise manner, this catalog is something of a godsend to me: one of my comps questions deals with comparing the ideas of Breton vs. Bataille in the art of Giacometti, Masson, Miro, and Picasso, and this catalog talks about all of them! The artwork these four men created (along with that by Arp, Dali and others) was rebellious and represented new kinds of modern art because they embraced the primitive, which “debased the base idealism” of Surrealism. Another one of my questions deals with Boiffard, and he was one of the primary– and most memorable– photographers for DOCUMENTS. Picasso had the lengthiest chapter (it’s really more of a conglomeration of subchapters), as he was a figure that was adored by both Breton and Bataille. Both projected their own ideas about art onto Picasso’s work, which really says something about his influence on art. DOCUMENTS reproduced more of his work than any other artist’s. 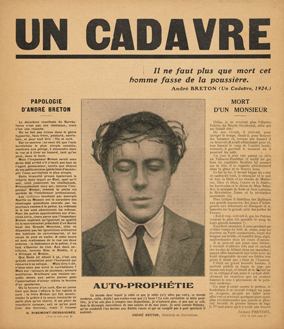 He had a strong relationship with several of contributors to the magazine, most notably Michel Leiris and Carl Einstein. Breton had described Picasso as “bearing the rays of light in each hand,” while Bataille saw his work as wonderfully horrifying and maddening (a couple other wonderful adjectives mentioned are “intellectual terrorism” and “anti-meaning”). Bataille politicized his art and Leiris saw it as a gateway to pushing reality beyond the limits deemed acceptable by orthodox Surrealism. His work was both grand and grotesque– just the way Bataille liked art. Jacques-Andre Boiffard was another artist who “crossed enemy lines,” having done work for both DOCUMENTS and Breton’s Nadja. He had a very short-lived career, as he decided to return to his medical studies in 1935. Only 17 photos of his were published in the journal– which is admittedly more than any other photographer– and they were by far the most memorable. He brought together the ordinary and extraordinary, yet does not express what meaning there is (if any). His photos occupied entire pages, whereas other photos usually only took up part of a page. He is admired and remembered for his heterogeneity: had his photos in DOCUMENTS not been accompanied by credit lines, it would be hard to tell that one person took such a wide variety of photos. Andre Masson more or less stayed on the “dissident” side of the Surrealist divide, as he is pretty damn violent in his work: he confronts the reality of murder and death, as well as “love.” He challenged reality through hallucinations, which was accomplished by linking the biological (the corporeal reality of the body) with the expression of hallucinatory impulse. According to William Jeffett, “while Masson’s work of this period is often presented as Surrealist automatism, it is more accurately described in terms of purely mental images originating in a rhythmic, biological pulse or spasm” (118). The painting on the right features eyes, either of birds or simply disembodied, merging with or associating with women’s breasts. The catalog’s discussions of Miro and Giacometti were very brief and embedded in larger topics, though period essays on their work were reproduced. Bataille believed that Miro turned reality into “sunlit dust” and that he wanted to “kill painting” (134). In regards to Giacometti, Leiris loved his work because it was fetishistic. However, Giacometti was “dissident” in the early stages of Surrealism, but he eventually crossed over to the more orthodox side (though his notion is questionable– check out my essay on Rosalind Krauss’s “No More Play“) . My next step after reading this catalog is to return to Breton’s Surrealism and Painting to compare what he says about Picasso, Masson and Miro (and Picabia, for that matter. That will be applicable to my question about how Duchamp, Tzara, and Picabia dealt with the transition from Dada to Surrealism).